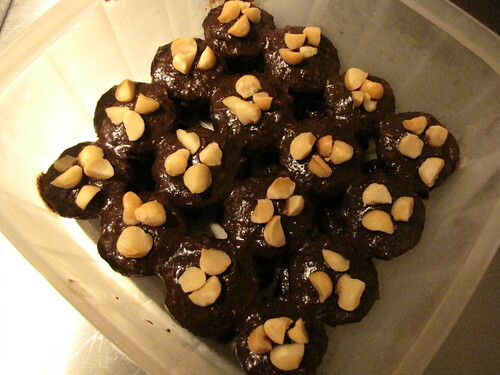 For Cupcake Camp 2010, I wanted to re-create something I first baked many years ago: a dense, dark chocolate cake with chocolate glaze topped with macadamia nuts. I made up a practice batch which I fed to my co-workers. I had some trouble with the glaze even though I followed the well-tested family recipe to the letter: the results were kind of chunky and grainy instead of glossy and smooth. Also, it was suggested to me that I try a heavier base cake to better support the richness of the glaze. So, for the big event, I made my mini cupcakes with the dense chocolate loaf recipe from Nigella's How To Be A Domestic Goddess. 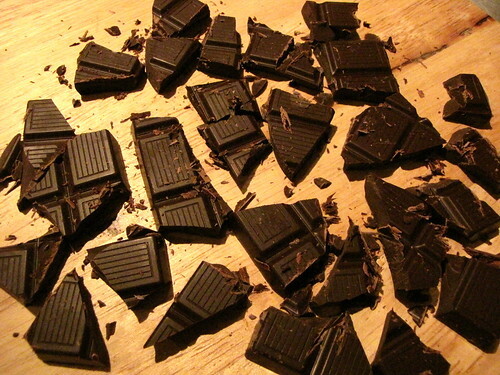 Instead of powdered cocoa, this cake is made from melted dark chocolate. I used Cocoa Camino's bittersweet chocolate bars. Even though that recipe is known to create a very dense cake, my minis were no more solid than other standard cupcake batches. I realize now that it's difficult to make a mini cupcake of substance because the dimensions are just too small. And, on my second attempt at that glaze icing, I had the same chocolate tempering trouble. The texture and appearance were all wrong even if the taste was alright and it worked well with the saltiness of the macadamias. 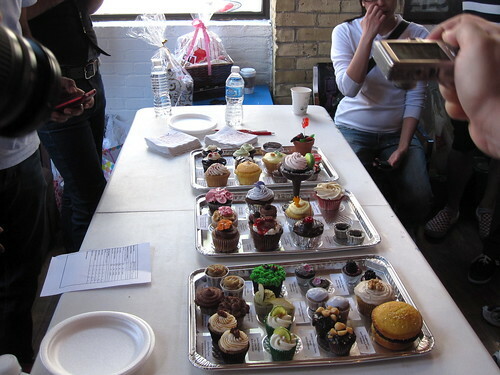 So, I turned up at Cupcake Camp with four dozen ugly mini cupcakes which had to sit beside the perfect professional ones. Sigh... Presentation counts for quite a lot with this crowd! But, hey! People still ate them! Anyway, the event was really different this year from last year. 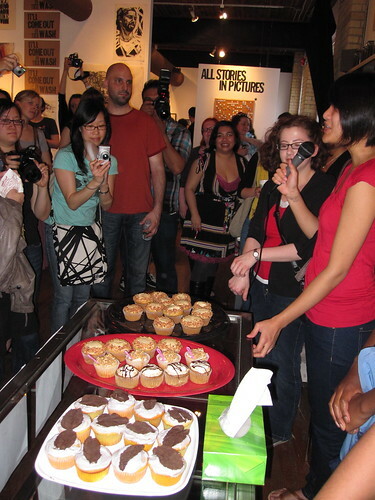 For one, many more bakers signed up and there was something in the order of 2000 cupcakes to go around. Also, with just 175 taster tickets available, the crowd was much more manageable and there was no shoving or grabbing. It was altogether civilized. 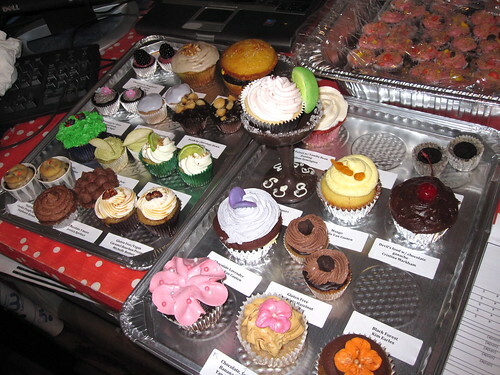 Throughout the afternoon, I caught up with a number of my Twitter friends and I sampled at least 10 different cupcakes. Canice's s'mores were prize winners, as were the delicate and luscious strawberry daiquiri cakes. I had a taste of the "most unique" Fat Elvis banana cupcake although I admit I was mostly admiring its airy peanut butter icing and my bite didn't contain any of the bacon crumble topping. 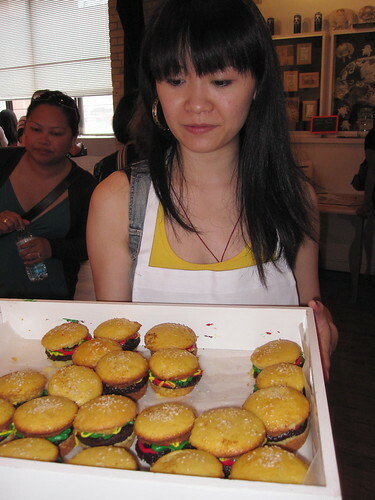 Michelle's Oreo cheesecake minis stood out, and so did the salted caramel cakes. 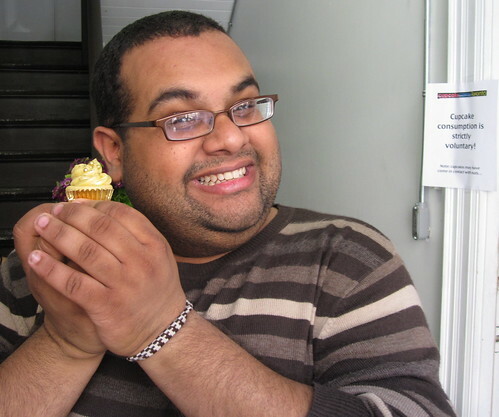 If you did the math for the numbers given above, you'll calculate that the ratio of cupcakes to mouths was approximately 10:1. I really did my best but I ended up going home before all the cakes were presented. The sugar was getting to me: I was in need of a cup of strong tea and a lie-down. 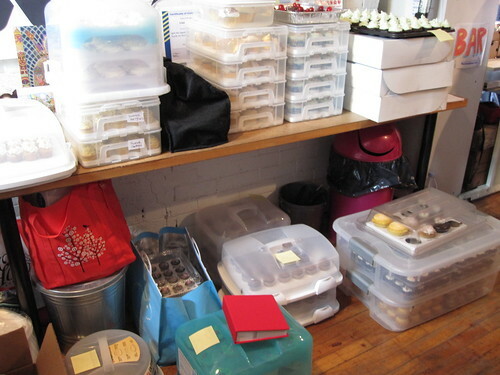 For me, being unable to eat any more cake is the sign of a great party! Congratulations and thank you to Monica and Michelle for everything! 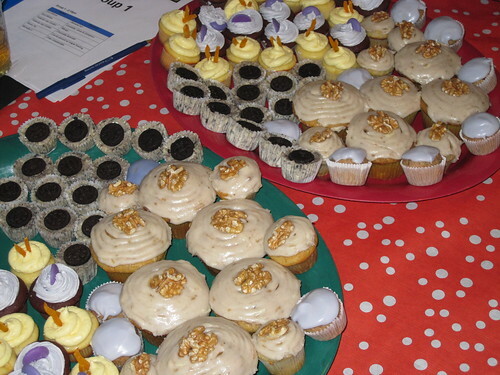 PS: This whole event was also a fundraiser for the Daily Bread Food Bank, so it wasn't all sprinkles and frivolity! and - we're also happy that you decided to bake again this year! !